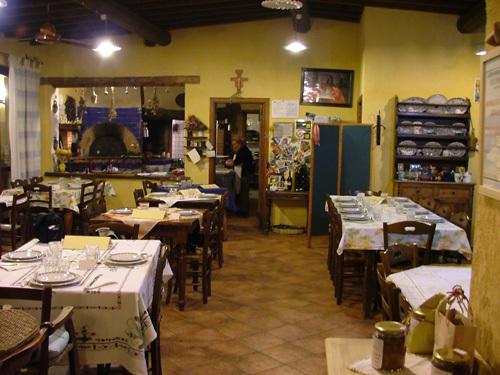 Ristorante Gli Attortellati: one of the very best restaurants in Grosseto. Over an Italian Christmas lunch with friends they told us of their favourite restaurant in Grosseto where you may "mangia molto bene" - eat very very well indeed. A restaurant recommendation from friends and family is always one you can rely on: good food is an integral part of everyday life in Italy and all experiences of eating out, whether it be insufficient salt in the pizza base dough, or the way a Florentine steak was cooked, are readily shared. Word of mouth recommendations and disappointments are very strong forces in Italy. A recommendation over Christmas lunch, therefore, is definitely one to remember and share. And this restaurant, it is clear from other Italian reviews, is considered "ottimo" (excellent), and the best in Grosseto. 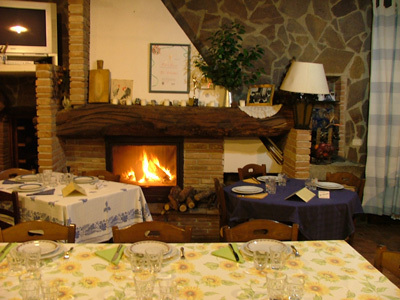 Ristorante Gli Attortellati is part of a family run agriturismo (farm offering holiday accommodation), complete with pigs and other livestock. It is professionally run and family friendly. All the food, which is traditional Maremman cooking - "cucina tradizionale Maremmana" - is home-made and cooked on the premises. The grandmother makes the pasta and breads, and in a corner of the restaurant there is an open oven (forno) where the you can see the latter being baked and then brought fresh to the table. The menu is a fixed one at Euros 23,00, exclusive of water, wine and coffee. But the addition of these to the total bill only adds about another Euros 3 per head. You must reserve a table in advance, as the food is prepared on the day for the numbers booked for the evening. And for something different, if you are the first person to book a table for a particular evening, then you set the menu with the owners! Choosing from a list of seasonal plates, with the chef choosing the "secondo piatto" to suit. You may eat as many plates of each as you wish! I have now eaten at Ristorante Gli Attortellati and look forward to doing so again and again as the opportunities arise. For me it is the best restaurant in Grosseto and ranks high on my list of favourites for the whole of Maremma. It was the first restaurant to be awarded the Primo "Ristorante Rurale" in Toscana award. All of their own produce - the meat from the animals that they raise and the vegetables grown in their "azienda" (farm) - is "biological" (organic). The house wine - which is a gorgeous and deep berry coloured Morellino - is Euros 4,00 for 1/2 litre, and Euros 6,00 for a litre. The bathrooms are spotlessly clean, with baskets of individual guest hand towels. For those of you visiting Maremma in a camper van - a great way to explore Maremma - the owners are happy for you to eat with them and park your camper van in their car park overnight! Now that's what I call perfect! As in most Italian restaurants, dogs are allowed inside Gli Attortellati. TIP: The amount of - great - food that this restaurant serves is considerable, so go there hungry!